NV Access began back in 2006 when two friends decided to create some life-changing open source software. NVDA (NonVisual Desktop Access) began as a pet project for Michael Curran. Michael Curran and James Teh have been friends since they were young boys and are the founders of NV Access, which is a non-profit organization based in South East Queensland, Australia. They met on a music camp for the blind and both share a strong interest in technology. Earlier in the week, Top 10 Website Hosting had the privilege to interview Michael to discuss NVDA in more detail. Michael told us that: “To use a computer independently as a blind person, I require special software called a Screen Reader, which will read the text on the computer screen using synthetic speech or braille”. This software can cost around $1000. Michael and his friends “wondered why there were no free screen readers available” and felt that it was unfair for blind people to have to pay more to be able to use computers. In 2006 this was all set to change when Michael decided to take the plunge and work on his idea and named it NVDA. His vision was to create a free version of the Screen Reader software that allowed him and so many other blind people to use computers to enhance their life and provide independence. The creation of NVDA would mean that he and his friends would no longer need to pay for commercial solutions. We were keen to find out what inspired Michael to make the software totally free to users all around the world. Michael informed us that he felt lucky that he had always received strong support from his family, community, and local charities. This enabled him to have access to the tools and opportunities to allow him to gain a good education and participate in the community. Michael wanted to provide this for other people who were visually impaired. NVDA was created to give blind people a “chance to contribute to society like I had been given”, Michael informed us. When NVDA began, the only Screen Reader products available for the Windows platform at that time were closed source.. (meaning there was no access to the code). Michael had been using Screen Readers for years, so was familiar with how the software should look, feel and work. In addition, he had been working with other open source projects on the Linux platform so saw first-hand how open source development can enhance a business model. Michael decided that an open source model was the correct path for NVDA. Although there was software on the market back in 2006, Michael told us “There were no courses, references, or sample code I could really rely on”. This meant that he had to start from scratch and completely re-invent the wheel. Another reason for making NVDA open source was that Michael wanted to allow other blind people to contribute to the software. He felt this would both allow others to have a say in the direction of the software and also enhance the experience for all. Thanks to very many volunteers and the open source model, NVDA has also been translated into over 50 languages. To date Michael told us that “about 46% of all code contributions come from outside of NV access “ and also NV Access has “had contributions from at least 184 people across the globe”. NV Access is supported both by its contributors, as well as receiving donations and grants to fund the continuing upgrades and allow the company to run. In addition to this NV Access provides a range of paid services to support organizations who are utilizing their software. In a fast-paced industry such as software development, it is imperative that continual updates are made. As new software is released, for example, a Windows operating system or browser update, NVDA must keep up to date. To make sure that the software remains compatible and ensures “the blind person is not left behind”. Michael proudly told us that “We are known for staying at the very forefront of compatibility with other software”. Having a global team of contributors as well as dedicated in-house specialists allows NVDA to keep ahead. Michael told us that a lot of the time NV Access is the very first screen reader to be updated in line with new software releases (such as a Windows operating system release). For those with older system requirements, NV Access has backdated software that is available to download via their website. 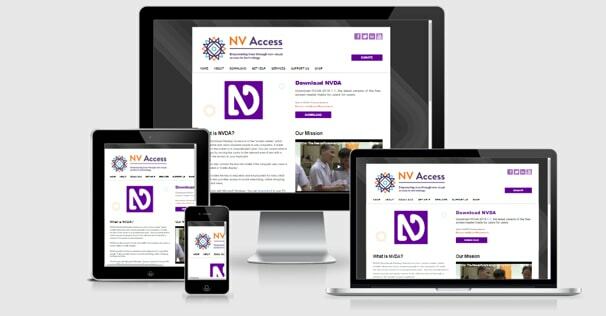 NV Access has made it as simple and accessible as possible to download their free software by providing concise documentation on their “Download” page. NV Access is available completely free of charge for blind or visually impaired people worldwide. Michael told us, “that we tightly adhere to web accessibility standards”. This allows the users to have full access to computers and the internet where ever they go. NVDA can be used anywhere, however Michael feels that his SaaS makes a greater impact in the home, “as this is the most likely place where a blind person may not be able to get access to an existing commercial screen reader due to lack of funding”. NVDA also enhances access to computers for blind people in educational environments. Should organizations wish to use or enhance NVDA then NV Access has this covered too. They provide a wide range of services to make sure that NVDA is utilized to its full capacity. SaaS – NVDA is the key free Open Source Software Product provided by NV Access and provides free Screen Reading software for the blind. Consulting – NV Access provides high-level technical advice and accessibility reviews for those developing windows applications for the blind. Customization – For users wishing to enhance or extend NVDA, NV Access is happy to implement requirements. NVDA is already an amazing tool for the blind and is used widely around the world. We wondered how Michael envisioned the company developing in the future and if they had any plans to expand. We were delighted to hear about some new developments in the pipeline that have been put forward by users of NVDA. These include new tools in “areas such as mathematics, access to graphs, diagrams and maps, and image recognition are all exciting areas we believe innovation can and will be made in” Michael told us. It was great to spend time with Michael and NV Access and learn about all how NVDA improves the quality of life for blind people all over the world. We wish them all the best for the future and look forward to their exciting new innovations.